…can only mean one thing. Summer is on its way! And we all know what that means, WEDDING SEASON, yay! It would seem from my latest posts, that our little blog is becoming more of a ‘weather watch’ than a space for awesome stationery. Let’s fix that……BOOM! Your eyes aren’t deceiving you, that would be some awesome stationery. This is one of our latest bespoke designs which showcases a lace illustration. We’ve shown this design at some of our recent bride meetings and guess what? It’s really popular! Not just the illustrative design but the fold too. We’ve already got orders on the books for the super practical concertina fold. No inserts, perfect hand held size when folded (A6) and a ‘wow’ moment for your guests when they open them. Want to see more stationery? BOOM! Destination wedding? 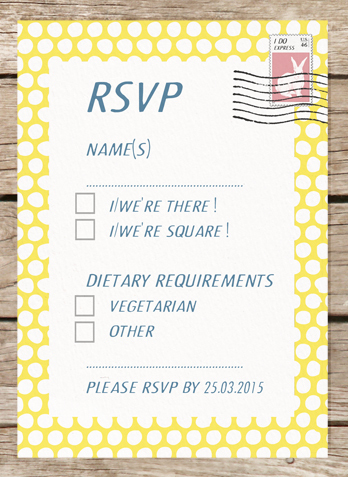 Tear-able RSVP’s? Boarding pass style? Yes. Yes and YES! 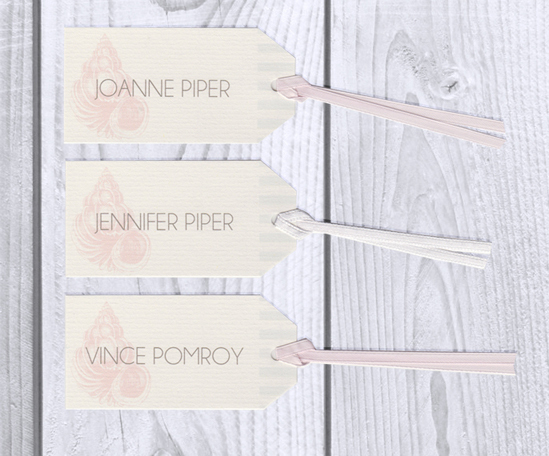 Our boarding pass invitations can be personalised like all of our designs. If you’d like them to look like an actual boarding pass, your wish is our command. Hello Lego people! More to the point, hello ridiculously ‘too cool for skool’ Lego people. Here bestowed upon you is a cracking example of somebody who went, “hello Be Our Guest Designs illustrator people. 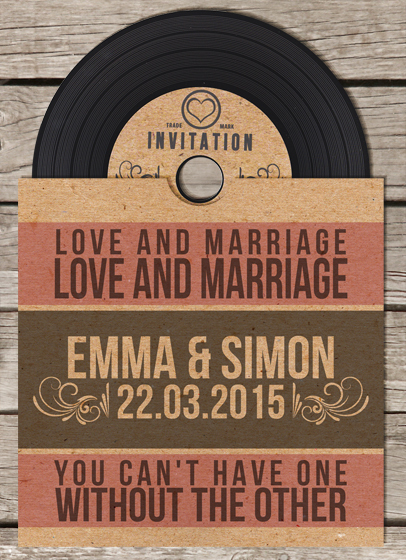 We would like a design for our invitations that is so personal to us that we won’t be able to find it anywhere. Can you help us pleeeeeeeeeeeeeeeease?” Errrrrrrrrrrrrrr, ya huh! And here is the evidence that anything is possible. How. Cool. Is. Their. Design? None of these bespoke designs are possible without a seed of an idea from our lovely couples who are looking for something special. All it takes to start the process is a little ‘Hello’. As we always like a challenge, we set about thinking about how to go about it. 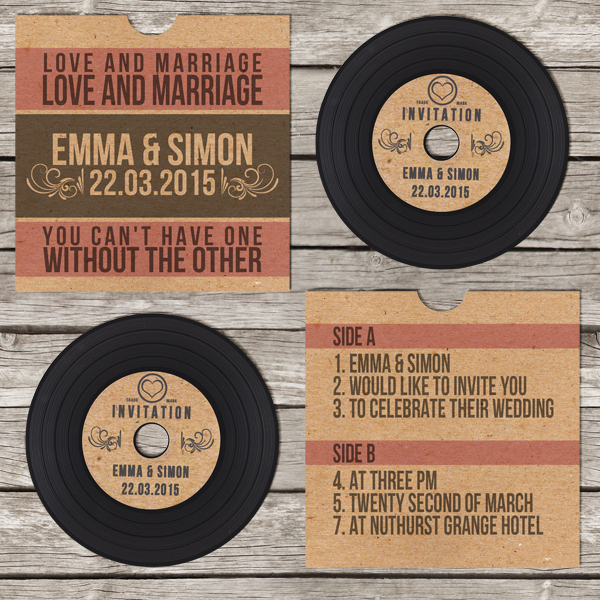 After a bit of thought and realisation that a lot of our weekends would forever be taken up with scouring second-hand shops and Ebay looking for bulk amounts of vinyl, we understood why you often find card imitation vinyl wedding invitations or you don’t find them at all. We know……awesome right?! 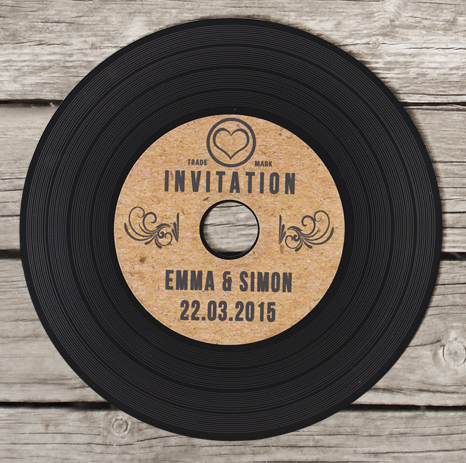 At a quick glance they look like any ordinary vinyl record but on closer inspection your guests will realise that it’s actually your invitation. 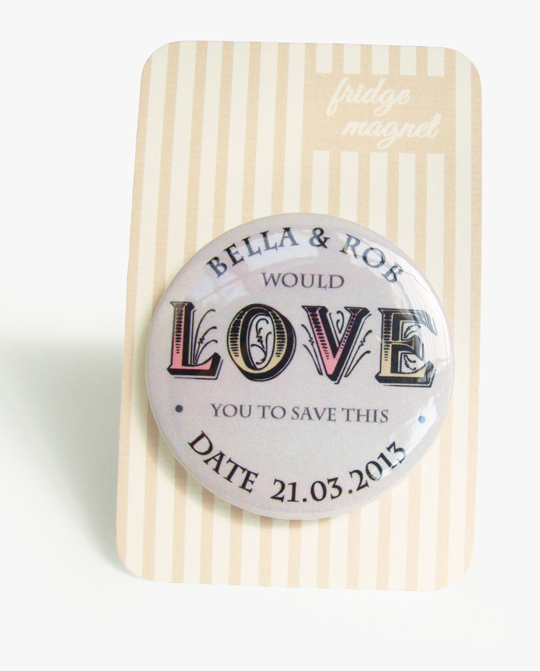 The label depicts the basic important information, your names and the date that will be known as your awesome big day. 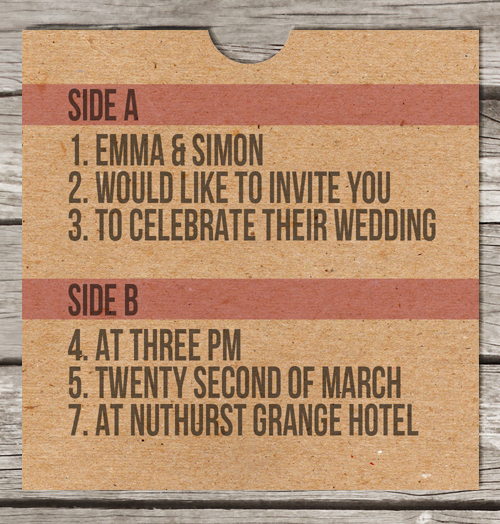 The packaging is cleverly designed to look like the track listing, when in fact it is the listing information all about your wedding day. They also hide a little secret. 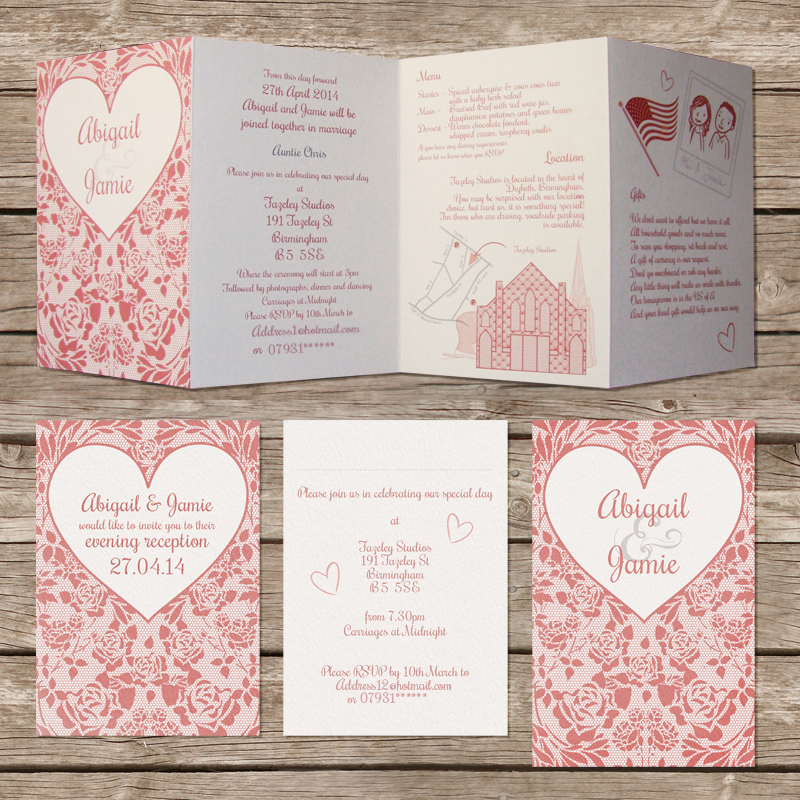 You can load these little babies with all the information your guests will require to attend your day, making the extra inserts of invitations, redundant. Pop your ‘vinyl’ in a computer or laptop and you will be able to open a styled page showing all the information required. 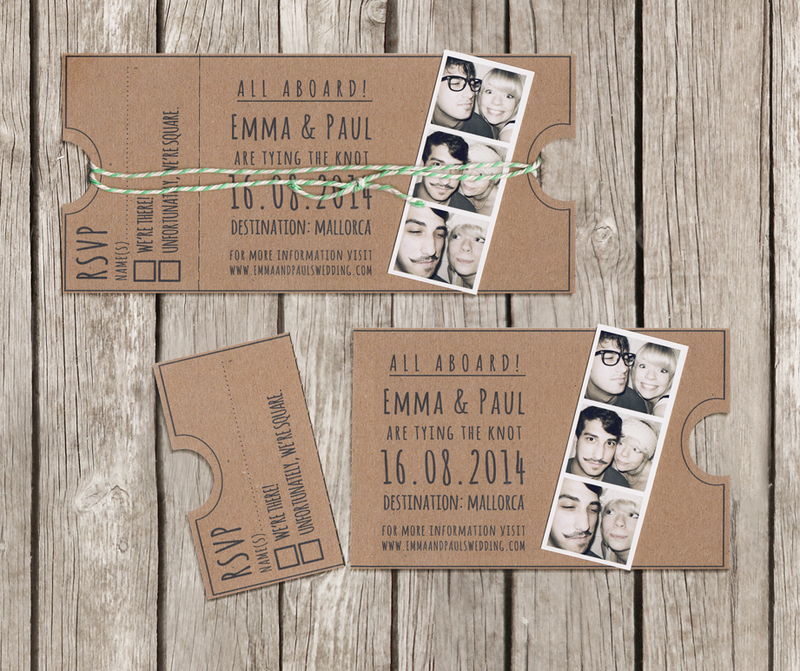 your guests can even open and print their own RSVP to send back to you. You’ll be able to get your filthy mitts on these invitations and give them a good hands on feel, if you come to say ‘HI’ to us as one of our autumn fayres. Check our events page for venues and information. Now, who’s going to hunt out their old turn table?? 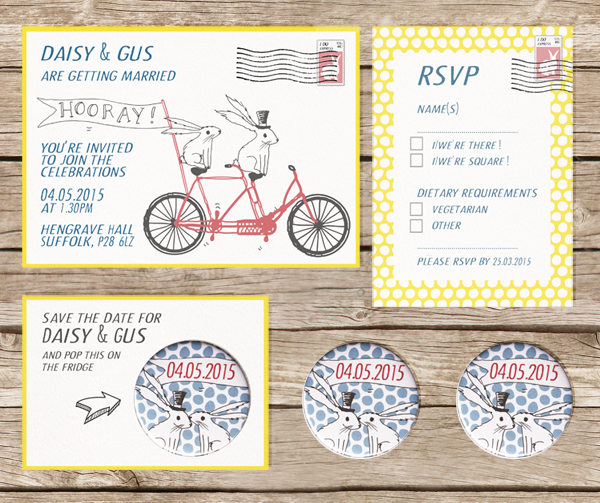 Do you think if you chose to send out our new stationery suite as your wedding invitations, the little long eared fellas would inspire an impromptu group dance of the ‘Bunny hop’ at your wedding reception, High School Musical styley?? If there is an inkling of this happening, can we come?! 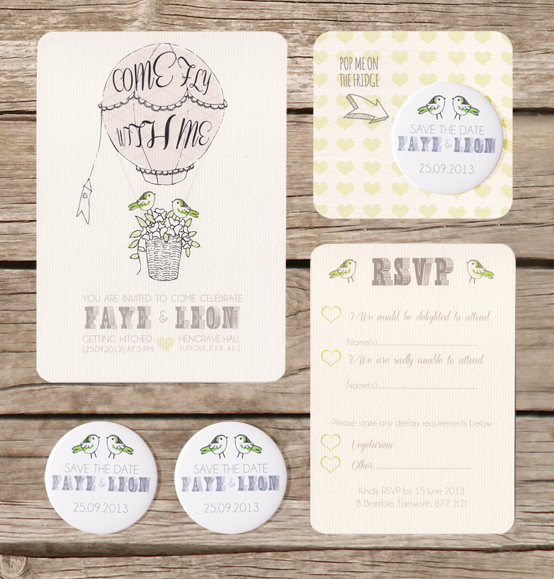 If a yellow colour scheme isn’t your cup of tea, our little furry friends design can be altered to suit your awesome day. 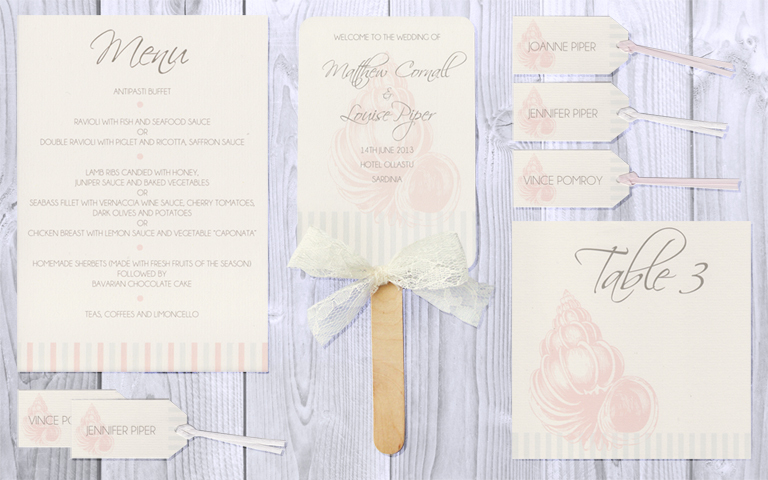 As with all our designs, colour scheme and wording can be altered at no extra design cost and adds the personal touch to your stationery. 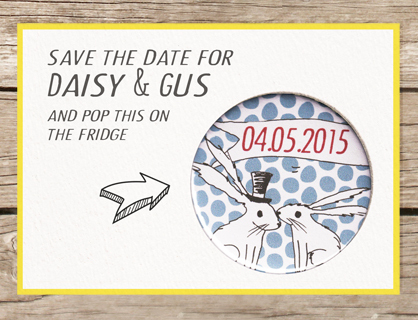 We’ve also included our very popular magnet save the dates with this showcase but you can choose to use any of our invite styles, including our Bunting save the dates. Well, as a very famous rabbit once said, “that’s all folks!” Or was that Porky Pig??? Anywho, I can’t think of another famous rabbit saying, so I’m running with it! 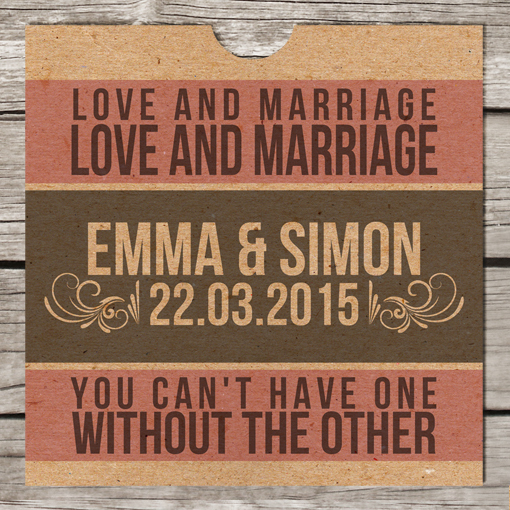 We love a bespoke design…. 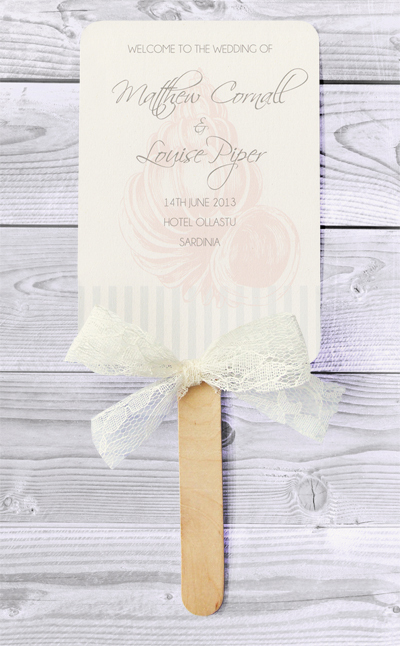 Louise contacted us earlier in the year, enquiring about ‘on the day’ stationery for her planned wedding to Matthew, in none other than Sardinia! Yes, you heard right, Sardinia. Our first international order, woo hoo!! After we composed ourselves, Louise gave us the brief of sea-side pretty with soft pinks and blue/grey hues. They wanted to include a nod to the sea without being ‘fairing sea dogs’………their shell and stripe design emerged and became the theme that ran throughout their stationery package. 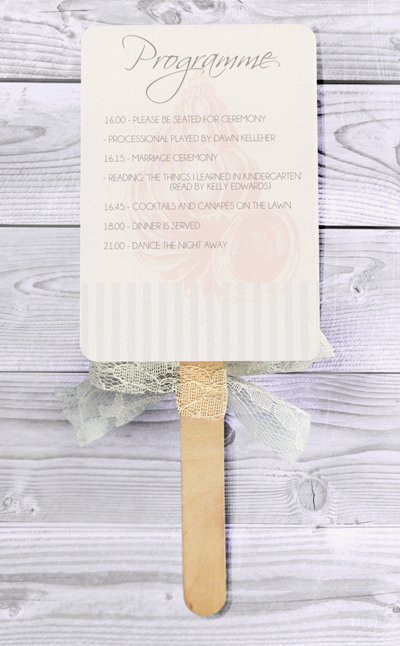 Another first for us, was also being asked to create paddle fans to keep their guests cool in the Italian sun and also function as their ‘order of the day’ information. Along with the menus, place names, table numbers and information cards, we hope the guests at this fabulous wedding appreciated the stationery as much as we appreciated being asked to be a small part of Louise and Matthew’s day. 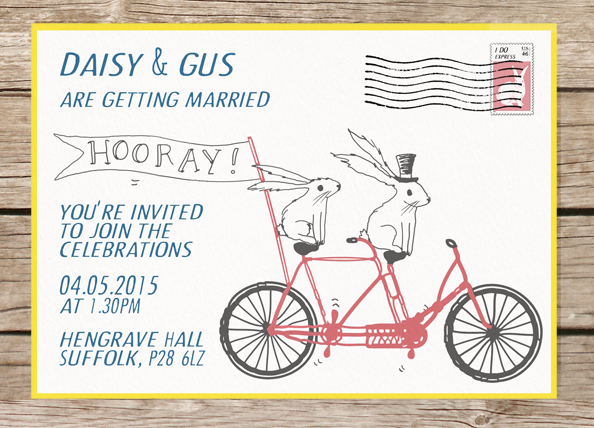 Our designer Hannah has been a very busy bee and has illustrated a couple of new designs. I love them! As you know from one of our previous designs “Don’t forget your passport…”, we love any excuse to crowbar a hot balloon into a design, and what a better way than a ruddy big fat one as the main feature. 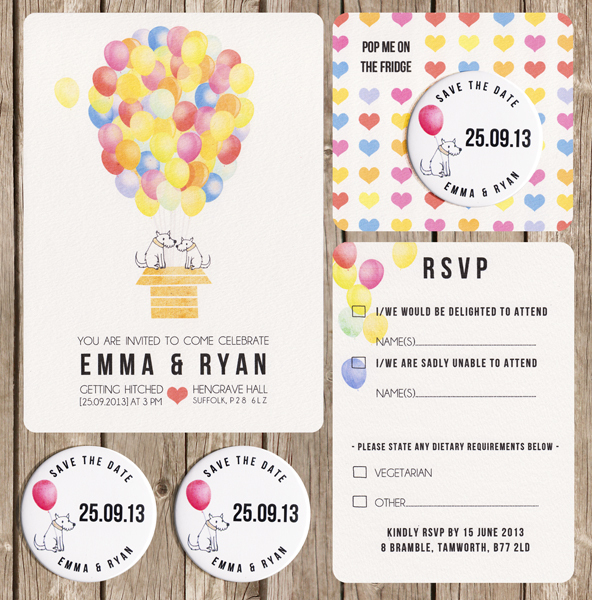 “Up, up and away” can be found in our ‘Off the peg’ ranges and can feature our newly added save the date magnets. This is an elegant, pretty but fun design and can be altered to suit any colour theme. 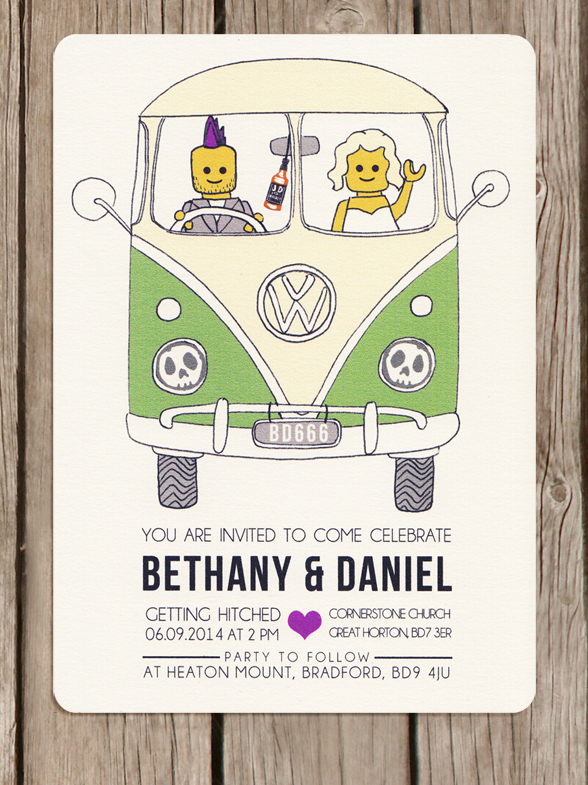 If you’re after a more colourful way to include some sort of air filled transport into your wedding invitations……..then how about “Pop!”. 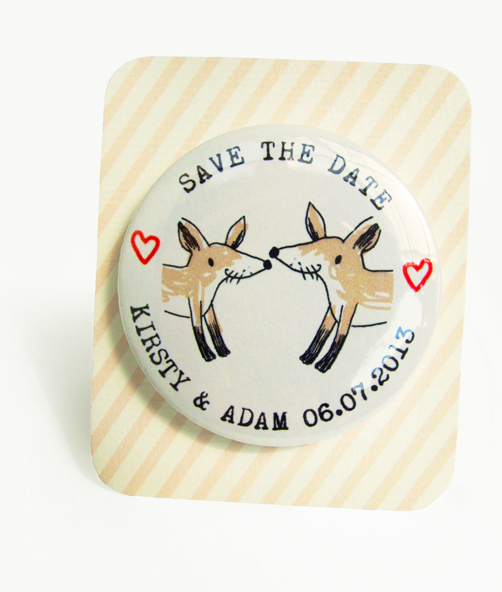 This design can also be found in our ‘off the peg’ range and also can include our save the date magnets. As with all of our designs, the final outcome is your decision. If you’d like to change part of the design, please get in touch with us at beourguestdesigns@gmail.com to let us know your ideas. For crafty and designer types, one of the most exciting things EVER is finding new tools and gadgets of the trade. So, I hear you ask, what is this amazing new tool we’ve got and what is it creating?? Well, we’re now able to offer magnets, badges and keyrings. What ever may take your fancy.